Link here to find out more about the national snail survey. The most common, big brown snail is Cornu aspersum. 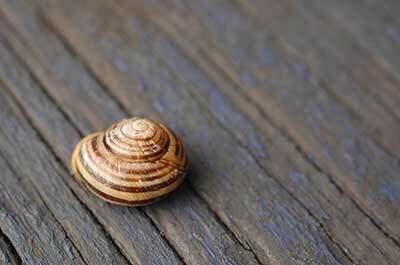 Stripey snails, Cepaea species, are a little smaller and often brightly coloured in yellow, white and brown. They are much less of a problem. As it gets colder and the snails retreat, now is the time to clean out your plot and check out snail hiding places where they spend the winter—piles of bricks, stones, behind the wooden sides of raised beds. All cosy hibernation spots. And get ready for spring, when snails do most damage, munching after dark or in the wet. Because of the protection provided by their shells, snails can move more freely over dry terrain than slugs. They can climb high into your plants and trees and go for seedlings, new shoots and plant crowns. Snails also eat decomposing organic matter such as rotting leaves, dung and even dead slugs and snails—so good to allow a few to reside in the compost heap. Don’t think about eradicating snails altogether. Better to use the following methods to keep their snacking to reasonable levels. Rather than sow seed for certain varieties, bring on or buy plants. Predators such as thrushes, toads, hedgehogs and ground beetles help us by feasting on snails. Encourage them. Traps, such as scooped-out half orange, grapefruit or melon skins, laid cut side down near vulnerable plants, jars or fruit juice cartons (see Tips) part-filled with beer and sunk into the soil all work. Check and empty regularly. Barriers such as copper tapes around pots work. 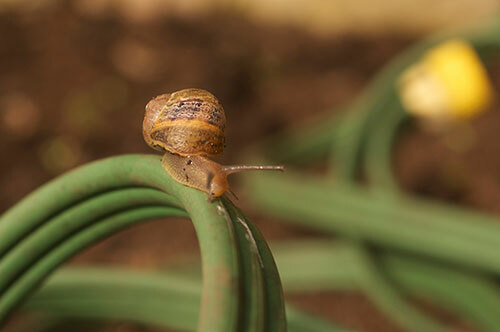 Grit or egg shells can be placed around plants creating snail barriers. Pick snails by hand, especially on damp days, and dispose of them.